I saw a group of British teenagers eating the last of a large box that they purchased. One was sucking the powdered sugar off of his fingers before telling the others he was going back in line for more. To be honest, I debated slightly if I felt like waiting in the summer heat, but the the line was surprisingly fluid and I took the plunge. After about 10 minutes, I was by the counter trying to communicate with my fingers (unfortunately Portuguese is not my forte) the amount I wanted in front of a surly woman with glasses. She sighed and said the amount in Portuguese, while I focused on the cash register’s small LED screen with the price that appeared and paid for my order. Another section of the counter dealt with delivering the orders. I handed them my slip of paper with the information, received a small blue package and out I went from the crowded bakery. I bought a little extra thinking I would snack on this later in the day after lunch… Well, it turned out that it became my lunch. 🙂 I pulled out one to try. It was hot and fresh, and smelled amazing. The center was yellow and had an interesting uneven look to it. I found a small packet of powdered sugar, added it and took my first bite. It was probably one of the best tasting pastries I have ever consumed. It had the right amount of sweetness and the flavor just flooded my mouth. I ended up enjoying the rest of my little package on a park bench by the horse carriage museum under the shade of a tree. Unfortunately, once you taste the best, the rest of the copies are truly no equals to the original. It made it hard for me to eat variations from other locations in Lisbon and in Portugal for the rest of my trip. And there is good reason for that. The recipe has been a tightly guarded secret for over a century. 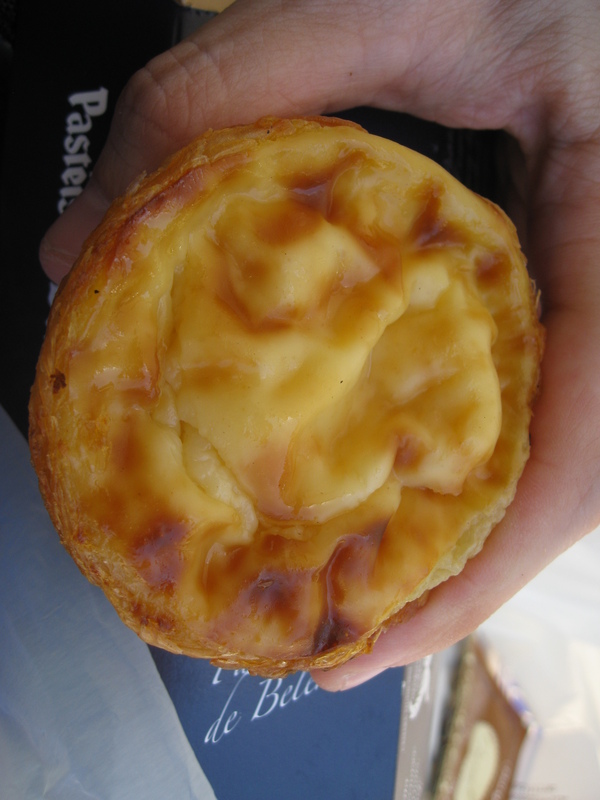 I hope to have another opportunity to consume this Portuguese treat very soon, or at least to find a half decent recipe to tide me over until I get to be in Belém again. If anyone has any recommendations, I am all ears.